The Archdiocese of Milwaukee Vocation Office is happy to provide the following resource items to you at no charge. These free items are only for individuals who live within the Archdiocese of Milwaukee. Check the items you would like to order. All quantities are 1 unless noted. This booklet will help guide a man who is considering the priesthood through some simple rules of discernment that are grounded in the teachings of the Church and based on the writings of the great spiritual masters, such as St. Ignatius Loyola. This book is a definitive guide for men discerning a vocation to diocesan priesthood. Using powerful and entertaining stories, this book explains in down-to-earth language how to carefully discover God’s call. Booklet: Have I Been With You? This booklet is a practical guide for personal prayer for young disciples and it is meant to prompt a new and living experience of prayer. This booklet may accompany a young person who wants to know the "how to" begin praying. Coming to know is always a personal learning and learning how He has been with us so long is the soul of discipleship. Este libro es una guía definitiva para hombres que están discerniendo una vocación al sacerdocio diocesano. Usando historias poderosas y entretenidas, este libro explica en un lenguaje sencillo como discernir cuidadosamente el llamado de Dios. Folleto: ¿Te esta llamando Jesús a ser un Sacerdote Católico? Este folleto ayudará a hombres que estén considerando el sacerdocio a través de algunas reglas simples de discernimiento que están enraizadas en las enseñanzas de la Iglesia y basadas en los escritos de grandes maestros espirituales como San Ignacio de Loyola. This book is a guide for parents whose sons are considering priesthood. A Priest in the Family is a comprehensive resource for the parents of future priests, thoughtfully addressing common questions and concerns about seminary, celibacy and the life of a priest. Whether you’re uneasy or elated about your son’s interest in the priesthood, this book is for you. 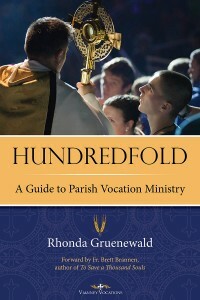 This book provides step-by-step guidance on how to carry out dozens of vocation-oriented activities in your parish, from powerful Holy Hours to innovative ways to support seminarians and inspire altar servers. It’s written for ordinary Catholics in ordinary parishes who want to inspire an extraordinary new generation. Vocation Lessons is an online curriculum supplement for K12 Catholic schools, parish religious education and youth ministry. It focuses on teaching students about vocations to marriage, the priesthood and religious life. This brochure gives six helpful and holy tips for young people to discern vocation in life whether it be: marriage, priesthood, religious life or single life. It addresses specific questions that both men and women might have regarding the discernment of priesthood and religious life, respectively. This is also a perfect resource for youth ministers and catechists. The Church's need for priests is growing. This brochure is a perfect prayer resource for parishes who want to help build a culture of vocations. By enrolling in the online Invisible Monastery, you pledge to pray daily or weekly for vocations to the priesthood and consecrated life. Este Folleto brinda seis santos y útiles consejos a jóvenes para discernir la vocación en la vida ya sea el matrimonio, el sacerdocio, la vida religiosa o a la vida soltera. Este también es un recurso perfecto para ministros de la juventud y catequistas. Sleek four-fold brochure covers a lot of ground in a little space. Filled with inspiring photos, the brochure explains the dignity and importance of the priesthood, then walks readers through practical aspects: signs of a priestly vocation; discerning celibacy; how to apply to seminary; what seminary is like; and tips for discerning. 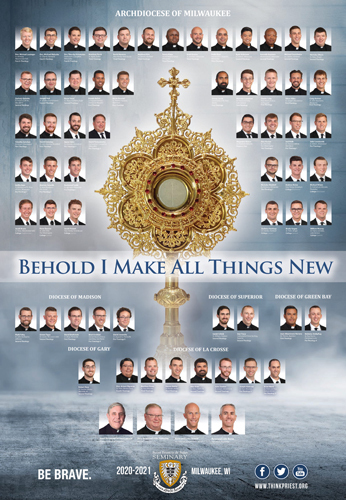 Seminarian poster displays all current seminarians. 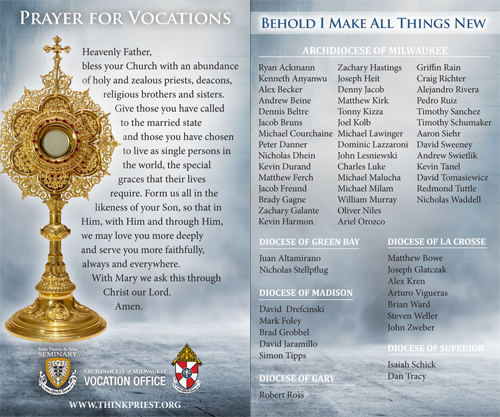 Size: 18" x 26"
Please make use of the prayer card, which displays the names of all current seminarians, in your parishes, classrooms and homes. The Church needs priests and you play a significant role in that growth. This DVD explains how everyone, especially family members, play a role in discernment to the priesthood. Audio recording of Archbishop Jerome Listecki and Fr. Luke Strand includes meditations for the priesthood and consecrated life before each decade. Free resources are available only to Archdiocese of Milwaukee residents.